When I first moved to Oklahoma I realized that many people cooked their vegetable way different than I was used to. I am not sure if it is just a regional thing or not, but many people here cook their vegetables to death. I think it may actually be just an older way to cook them, not so much a regional thing. I know they like them that way and have eaten them that way, but in my opinion there is no reason to cook things like green beans for hours and hours. Okay, well maybe they don’t cook them for hours, but they definitely cook them much longer than I do. I like my green beans cooked, but I like them to still be green. If I want my green beans cooked for a really long time, I can just buy them in a can. I know that many of you may not agree with me. You may like your green beans that way, so please forgive me for disagreeing with you. And if you do like them cooked like that just cook them longer than I have suggested in this recipe. I am sure the recipe will still be very good. Does anyone agree with me? Do you like your green beans cooked for long time or a short time? Cook onion in oil, until onion is tender and slightly browned. Add green beans and tomatoes and stir well. Cover and cook on medium low, stirring occasionally, until bean reach desired tenderness. For me this is about 10 minutes. I completely agree with you. I like my vegetables to be al dente most of the time. I thought I hated vegetables growing up, but it turns out that I hate vegetables that are boiled to death. That is how my family always cooked them, but when I got married and discovered steaming, for a short time, I realized that I really like veggies…a lot! I bring them to a boil then remove them from the heat and let sit a few more minutes with the lid on. Perfect crunch but not too hard. 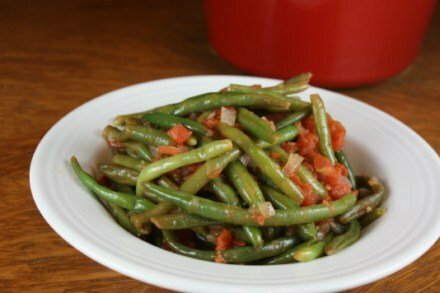 First time I had green beans & tomatoes was in Iowa with my step-mother. Never saw them here in Canada. The only way my mother-in-law knows how to cook a veggie is by boiling. Fortunately, my husband became a fan of stir fry all on his own and now eats most veggies except her. I enjoy crisp green beans cold in salads, but my favorite are roasted until their nearly caramelized. I love to eat green beans raw but when I have to cook them I prefer to steam them so they still have a snap when you bite into them. I remember my grandmother in Missouri serving home-canned green beans, way way overcooked. If we ate fresh, I don’t remember. In my days in Oklahoma I was too busy discovering TexMex food for the first time, that I don’t remember eating anything green, just tasty TexMex grease lots of grease, except fried zucchini and pickled jalapenos on nachos. Now in Maryland, having learned quite a bit about nutrition, the sight of green beans that are no longer green, makes me want to upchuck. When I see stuff like that, it ruins my appetite and make me suspicious about the cooking methods & preparation of the entire meal – I am no longer comfortable and make excuses not to eat. Really turns my stomach. Growing up I hated veggies; unless it was corn on the cob. (one of my grandma’s favorite dishes was canned spinach cooked in bacon fat–blech) After leaving home I figured out I can’t stand CANNED veggies but I love fresh or frozen. My parents still buy canned & when we go to visit my kids can’t stand the veggies. My oldest even asked why the green beans weren’t green & why the lettuce was white (it was iceberg). LOL My parents had a fit over that, so while we are there we serve lots of corn I think it’s the only veggie that can kind of taste okay. Gotta disagree with you here! Green beans have to be cooked… mushy almost! LOL! It is the only veggie that we like that way… well, except potatoes! We eat a lot of raw/fresh veggies rather than cooked in any way. If they are cooked, then just a little on the crunchy side is best. But, my family will only eat “canned” green beans… no frozen and no fresh. I’ve tried… we just don’t like them. And, home-canned are the best!!!!! !